My poem in this month’s Foliate Oak. I am sorry to have to announce that my novel, The Innsmouth Ladies’ Book of Household Management, will not be published by Kraken Press as announced. If you have pre-ordered a copy, please contact them. In which I struggle with my lifelong frustration with and affection for the work of Jean M. Auel. Key West is a magical wonderland, and only a complete lack of the appropriate financial and social resources prevents me from moving here immediately. Before I learned that I would be coming to this seminar and workshop as a runner-up for an award, I was, as I mentioned, obsessed with cruise ships. 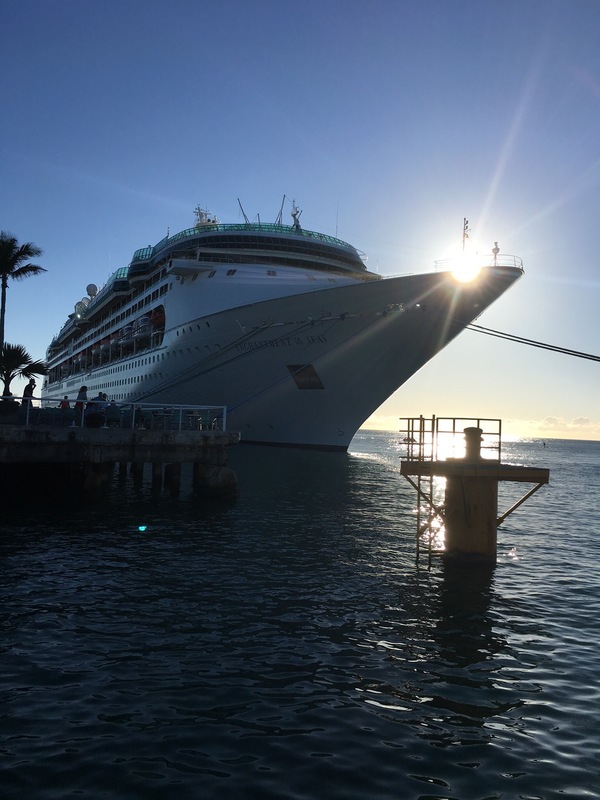 It was a particular delight for me to walk down the street in a post-air-travel haze and run into a docked RCI ship, the Enchantment of the Seas. All of RCI’s ships are named Something-or-other of the Seas, which is how I recognized her. I walked as close to her as I could without a ticket, in the hopes that I would be able to feel the ship’s presence — feel the immensity, feel what it was like to be near a floating colony the size of a small town. But I wasn’t able to feel anything about her. She was the size of a city block, and no more awe-inspiring to be near than that. Maybe if I get on board a cruise ship myself someday, I’ll be able to sense it better. 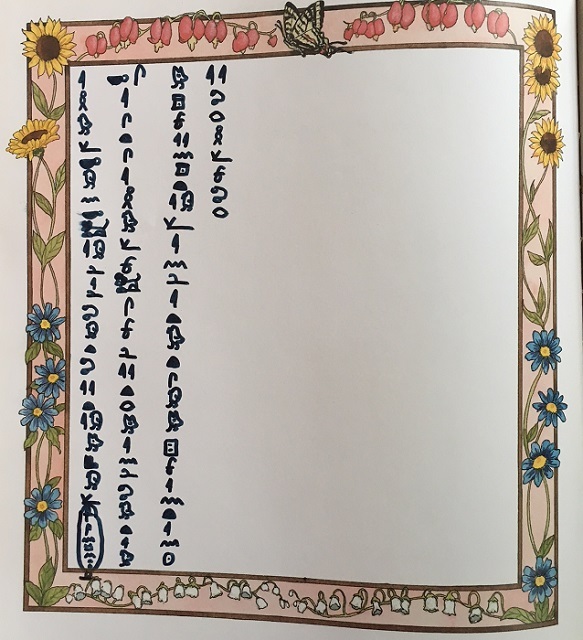 I am at my parents’ house over the holidays, where I always discover various regrets of the past, including the time I kept a diary in hieroglyphs. When scraped clean, this says, “I have concluded that the tomb of Ankhesenpaaten exists in a false [?] room and that I am going to find it at some point or another.” This is not particularly considered likely, but it amuses me that people have still been trying to find Nefertiti in the exact same way. The diary does not stop here, but it appears to largely dwell thereupon about how much I hate math and/or my teachers, and is less rewarding of careful decipherment. You have time for one more Christmas movie: a short one, about fifteen minutes, written and directed by the lovely McGhee Monteith (who is, full disclosure, in a family of old friends of mine). Cecelia Wingate gives the most Mississippi Delta performance I have ever seen. He Could’ve Gone Pro from McGhee Monteith on Vimeo. At Jericho, a scarab; in a grave, a scarab; in the grave of a girl, a scarab; in the grave of a wealthy foreigner’s daughter, a scarab; in the grave with the girl’s maidservant, a scarab. It is not a good world, this one. It was a worse world in the Bronze Age. Maybe the “adult female attendant” in this grave decided it was just as well if she lay down next to this little girl forever. But perhaps she did not; and for her, I think, there ought to be just a word in the headline.